Following the death of her husband in June, Regina Holliday began work on this amazing mural, which she hopes will draw attention to the failings of the U.S. health care system. Regina's husband Fred died from kidney cancer on June 17th, at the age of 39. As the Washington Post explains, for years the Holliday family did not have health insurance, and thus was unable to afford the tests that could have diagnosed his disease earlier. By the time he landed a job that came with a health care package, it was too late to stop the cancer. Holliday now splits her time between caring for her children, working on her painting, and lobbying for health care reform. 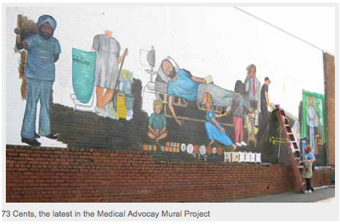 Holliday's current work is part of a larger project, The Medical Advocacy Mural Project. She has chosen to display her art in this form because, as she tells the Examiner, "murals are the museums of the public." Holliday's most recent piece, painted on the side of a gas station and titled 73 cents, shows her husband on his deathbed, surrounded by the debris of his illness. He holds a note that reads: Go after them, Regina. Love, Fred." She explains: "That is what he told me to do. That is what I am doing."